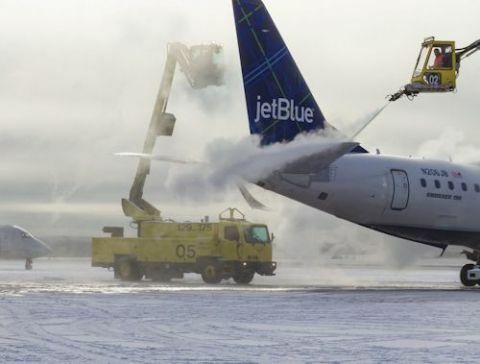 Airfield maintenance crews at Portland International Jetport (PWM) in Maine had one less item on their to-do list last fall: They didn’t have to order any aircraft deicing fluid for the upcoming winter. It was a bold change for the Atlantic coast airport, which receives an average of 62 inches of snow annually and is no stranger to blistery nor’easters. The airport’s product is coming from its own on-site plant, which manufactures aircraft-grade deicing fluid using virgin quality propylene glycol distilled on-site from effluent collected during 2016/17 winter deicing operations. Moreover, the plant has created two new revenue streams for PWM. It sells the deicing fluid it produces, and it collects fees from other airports for accepting their deicing effluent. Facility Size: 7,000 sq. ft.
As of December 2017, the facility had sold aircraft deicer to White Plains Airport in Westchester County, NY, and Logan International in Boston. 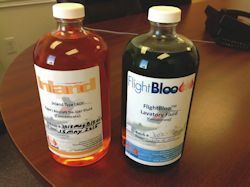 In addition, the plant produces and sells FlightBloo, an antifreeze used in aircraft lavatories, which is also manufactured using recycled glycols. The airport owns the recycling/processing facility and associated storage tanks; Inland Technologies International owns the processing and blending equipment inside the facility. Plant operators are employees of Inland, and the company owns the proprietary processes it uses at PWM. The airport and Inland partner to sell the plant’s final product. “It is structured that way so we both participate in the upside financial benefits of the sale,” explains Bradbury. The collection and recycling process has been a long time coming—starting about a decade ago, with PWM’s capital improvement plan. At the time, management was talking with the Maine Department of Environmental Protection about changing how the airport disposed of runoff from deicing operations. “Even though it was a small amount, we were essentially discharging effluent [containing propylene glycol] into the ocean via the Fore River,” Bradbury explains. Although propylene glycol is not toxic, it can kill fish and other aquatic life because it depletes oxygen as it breaks down in water. Being essentially landlocked on 769 acres, PWM did not have space available to construct aeration ponds or other commonly used options for treating deicing effluent. “We had to go in a different direction,” says Bradbury. The idea to pursue full capture and recycling was the result of research by airport staff and Stantec, PWM’s engineering consultant. The airport eased into the venture by contracting Inland to develop and operate a small on-site glycol recycling facility. 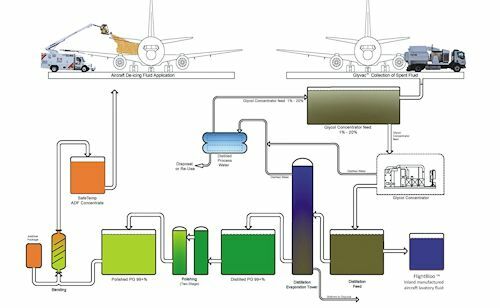 Operations began in 2010, with a collection system that captured the airport’s deicing effluent and equipment that distilled the fluid to 50% propylene glycol concentration and produced a raw-grade glycol product. Clean water left over from the process was discharged to the local wastewater treatment plant, explains Adam Thurlow, Inland’s plant operation manager. The facility even produced a small amount of revenue by collecting fluid containing propylene glycol from area businesses that use it for non-aviation purposes. One year later, Inland added a distillation plant for an in-depth trial. The goal was to determine the feasibility of creating a high-grade propylene glycol product that could be sold to area businesses for use in heating/cooling units and to winterize recreational vehicles. Soon, the facility began receiving and processing glycol-impacted stormwater from neighboring airports. The plant charged a small fee to further offset the operational costs paid by the city of Portland, which owns and operates the airport. By 2015, it was clear that the trial was working and full-scale operation made sense, explains Thurlow. By late 2016, the currently used 7,000-square-foot facility was commissioned. It combined existing 166,667-gallon underground tank and 333,333-gallon underground tanks with new aboveground storage on a two-acre site. These days, the facility has 60,000 gallons of Type I deicing fluid available at all times and can blend 10,000 gallons every five hours. Each year, crews at PWM spray approximately 100,000 gallons of aircraft de-icer, which contains about 50,000 gallons of concentrated Type I fluid, notes Thurlow. Effluent at PWM is collected in two ways: a drainage system on the deicing pad funnels it into underground tanks, and a mobile recovery vehicle vacuums it into onboard tanks. As the effluent is drained off the tarmac, plant operators use a valve to direct high or low concentrations of mixed deicing fluid effluent to one of the two underground tanks. 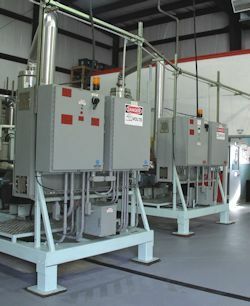 This saves time and resources during subsequent processing in the lower concentration tank. The Glyvac, a patented recovery vehicle the airport purchased from Inland last year, shears visible effluent off apron surfaces using air speeds of nearly 200 mph. It also scrubs away trace amounts of glycol with a wash bar. Since 2010, Inland has recycled about 6.5 million gallons of effluent at PWM, reclaiming 1 million gallons of pure glycol. Nearly half (47%) of the fluid it processes has come from other airports in the region—Bradley International in Windsor Locks, CT; Dulles International, Reagan National and Andrews Air Force Base in Washington, D.C.; New York’s LaGuardia and Newark Liberty International in New Jersey. While the economics of the process are positive, Thurlow notes that Inland has not lost sight of its original mission. Prior to 2010, the biochemical oxygen demand (BOD) readings were very high in the stormwater surrounding the airport. Since Inland began operating, levels have stayed below 300 mg/L. Between the revenue it earns from accepting outside effluent and selling recycled product, PWM expects to save 18% in the 2017/18 winter. “Business nirvana would be 100 percent; we’re not there yet,” quips Bradbury. “If we get to 50%, 60%, 70% offset, we’re getting pretty close. But even an aeration pond isn’t free.